This title will be available at UNM libraries soon. New York: Caroll & Graf Publishers, 1994. 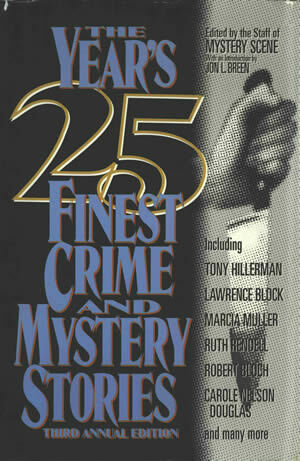 This compilation, edited by the staff of Mystery Scene, contains a story by Tony Hillerman entitled "First Lead Gasser" beginning on page 418. Hillerman's story deals with a death row execution that he witnessed while working as the New Mexico manager of the United Press. This volume also contains works by other well-known mystery writers such as Lawrence Block, Ruth Rendell, and Robert Bloch, and has an introduction by Jon L. Breen. It was published by Carroll and Graf Publishers Inc., New York, in 1994. Binding: Quarter bound, black cloth spine with blue paper covered boards. The book title, editorial credit, and publisher name are printed on the spine in gold.